"A mouthwatering Indian appetizer. Mildly spicy, serve hot with sweet and sour sauces, like tamarind sauce (found in the Ethnic section of most grocery stores) and ketchup." Place unpeeled potatoes in a large saucepan, fill with water, and place over high heat. Bring to a boil; cook until potatoes are soft and tender. Drain, cool, and peel potatoes. Place potatoes in a large bowl. Add salt, garam masala, coriander powder, pepper, and cilantro. Mash with a large fork or potato masher until there are no lumps. Shape potatoes into flat cutlets, about 2 or 3 inches in diameter and 1 inch thick. 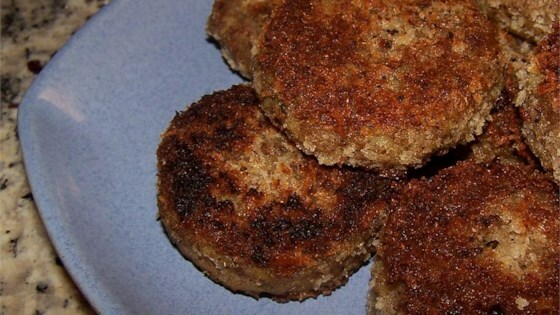 Coat each cutlet lightly in bread crumbs, and set aside. Heat about 2 tablespoons oil in a large skillet over medium heat. Fry potato cutlets in batches until golden brown on both sides. Between batches, add oil as needed. Based on the previous review, I used only half of the black pepper and these were very good. We dipped them in Curry Ketchup which was fantastic(found in European grocery). wonderful...though I reduced the quantity of black papper to 1/2 tablespoon. Also I added chopped and steamed radish and cabbage. would definitely make these again.. thanks!